Decided to pop into the brand-new Ritz Asia in Ridgefield, CT (on Rte. 7) on our way back from visiting family and checking out the flea market in Rhinebeck, NY, on Sunday. Typical Asian fusion fare - selection of sauces for sauteed veggies/meat/tofu, pad thai, sushi, etc. -- nothing too amazing. 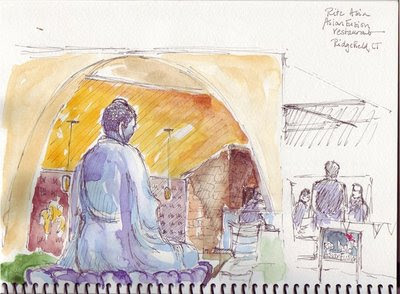 But the huge statue of Buddha in the middle of the restaurant just BEGGED to be sketched.